New Delhi, India – The India-Russia ties have received a boost with a $5bn deal that will see New Delhi buy an S-400 air defence system from Moscow despite looming threat of US sanctions. The deal to purchase the long-range surface-to-air missile systems was signed by Russian President Vladimir Putin and Indian Prime Minister Narendra Modi in New Delhi. “The sides welcomed the conclusion of the contract for the supply of the S-400 Long Range Surface to Air Missile System to India,” a joint statement said on Friday. Manoj Joshi, a foreign policy expert, said the deal was “extremely significant” because of its capability of reaching targets “300km away”. “It means India can take out an aircraft deep inside Pakistan or parts of Tibet. The prime targets are airborne early warning systems and electronic support aircraft which would have a multiplier effect on the capabilities the other side can field,’ said Joshi from the Observer Research Foundation think-tank based in New Delhi. Under a new US law, purchase of Russian defence equipment invites sanctions, but New Delhi has pinned hopes on a US waiver. The law, known as the Countering America’s Adversaries Through Sanctions Act (CAATSA), threatens to impinge on India’s massive defence trade with Russia. China has already been affected by the sanctions for buying weapons from Russia, including the S-400. 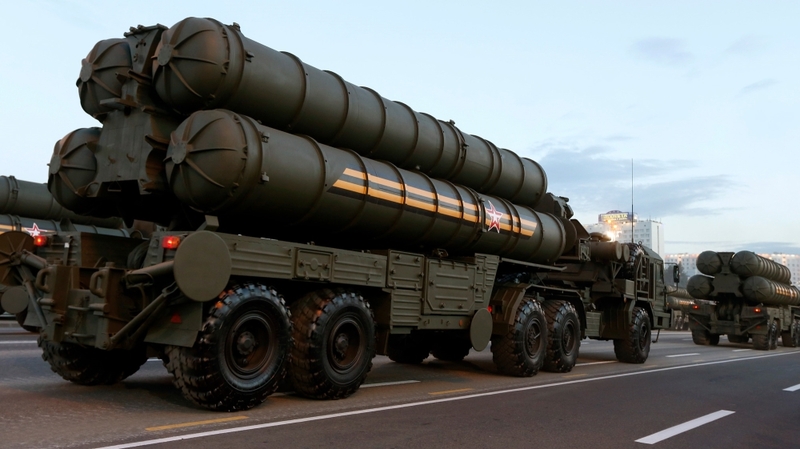 US officials have also repeatedly warned NATO ally Turkey against its planned deployment of the S-400s. Modi and Putin signed eight agreements during the Russian president’s two-day trip to New Delhi. The S-400 systems’ deliveries to India will begin in the next two years. “Your personal contribution to strengthen India-Russian ties have been invaluable. India places top priority on ties with Russia. In today’s fast-changing world, our relationship assumes heightened importance,” Modi told Putin. New Delhi’s overtures towards Moscow come at a time when India is also facing the heat of a US trade war through hefty import tariffs. Moscow has long been the main supplier of military equipment to India but in recent years, New Delhi has been inching towards the US and Israel for weapons supply. Modi’s right-wing government has pursued closer ties with Washington since it came to power four years ago. Relations between India and Russia had taken a backseat. But Russia still remains India’s biggest military equipment supplier, accounting for 62 percentof India’s total weapons imports during the past five years, according to the Stockholm Peace Research Institute. The deal signed on Friday is a setback to US efforts to “isolate” Russia and it would now have to choose between “punishing” India or agreeing to a waiver. 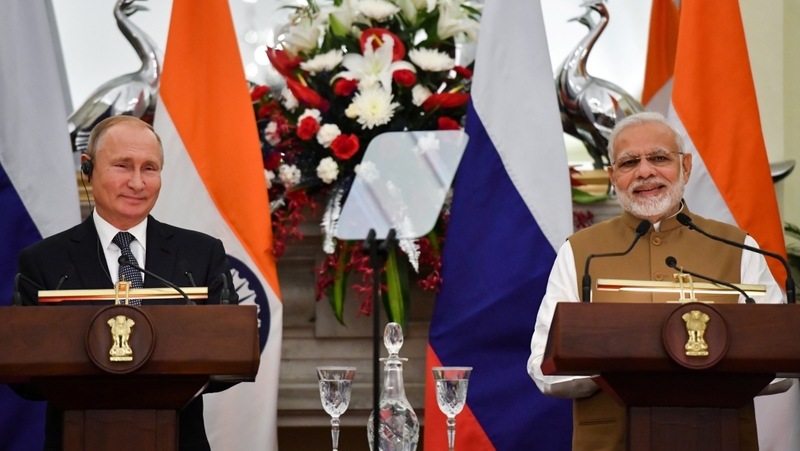 “This would reinforce the continued strength of a Russia-India partnership even amid a growing US-India relationship,” said Michael Kugelman from the Wilson Centre in Washington. Earlier this week, the US warned India against buying weapons from Russia, with a US State Department official urging “all of our allies and partners to forgo transactions with Russia that would trigger sanctions under the CAATSA”. “The US has made a law applicable to third countries so it must find the way out. Otherwise, it risks damaging its relationship with India,” said Joshi. Security analysts in Asia said US’ threat of sanctions is being seen as bullying and would not really deter deals like the one India just inked with Russia. “The thing to note is that sanctions will only come into place when India makes payments for these weapons which is not likely to happen till much after the deal is signed,” said Pramit Pal Chaudhuri, Foreign Affairs Editor at Hindustan Times. Analysts say Washington’s response to the India-Russia deal will be a major determining factor of the future of US-India relations. “If the US takes the dramatic step of punishing India, which it describes as a key strategic partner, simply for concluding an arms deal with one of Washington’s foes, then that could raise questions as to how serious the US really is about its partnership with India,” said Kugelman. India’s relations with the US have also been hit by trade frictions, with New Delhi seeking an exemption from higher tariffs on steel and aluminum imports announced by President Donald Trump administration. New Delhi, incensed by Washington’s refusal to exempt it from new tariffs, decided to counter-impose higher import tariffs on some US goods. Earlier this week, the US president criticised Indian trade tactics as being protectionist. “India charges us tremendous tariffs. When we send Harley Davidson motorcycles and other things to India, they charge very, very high tariffs,” said Trump. On Thursday, Reuters news agency quoted shipping data tracker Kpler to point to a cut down on US crude oil purchases, adding that Indian firms were loading up on Iranian oil ahead of the restart of US sanctions next month. Both India and Russia continue to trade with Iran despite the threat of sanctions although since June Indian refiners have steadily cut purchases of Iranian crude. Trade volume between India and Russia in 2017 crossed $9bn and Putin announced the two countries are setting an ambitious target of $30bn by 2025. Last year, Russian oil major Rosneft purchased Indian refiner Essar Oil – the biggest foreign acquisition ever in India – in a $12.9bn deal. Strategically, Russia has facilitated India’s membership in the Shanghai Cooperation Organisation and endorsed India’s long-held demand for a permanent seat at the UN Security Council. Moscow is also pushing for India’s entry into the Nuclear Suppliers Group, a club of countries controlling access to sensitive nuclear technology. “Washington’s plans to hit Russia’s defence trade aren’t really realistic,” said Vassily Kashin at the Institute of the Russian Far East. “The US demanded from a number of countries to unconditionally limit their own sovereignty in choosing partners in arms trade just because the US said so and threatened sanctions,” Kashin said from Moscow. Netflix’s ‘Maniac’: What is it really about?